For months now I’ve wanted to make a pulley system with the kids. With the approach of fall, we decided it would be a fun STEM activity to do in October. Fall is in the air. The temperatures are changing, and apples and pumpkins seem to be everywhere. It’s the perfect time for pumpkin activities. 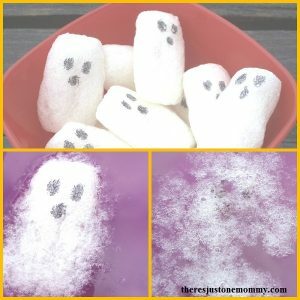 Whether you make it indoors, using your stairway like we did, or you try it outside, this Halloween STEM activity is super fun. 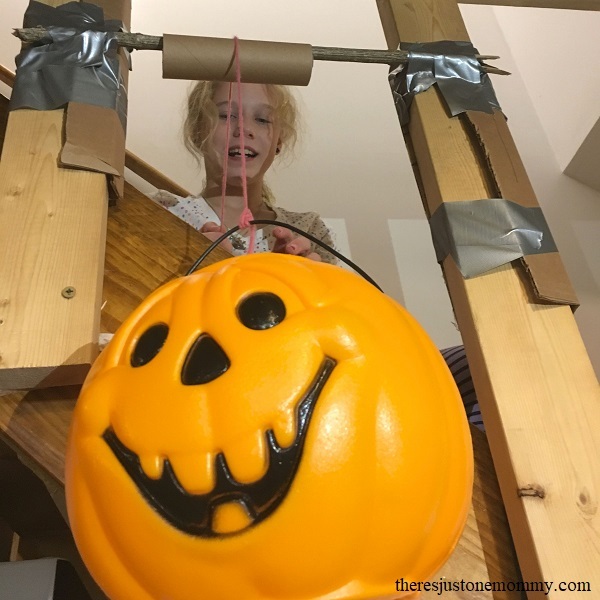 Gather the kids and make a Pumpkin Pulley this week! 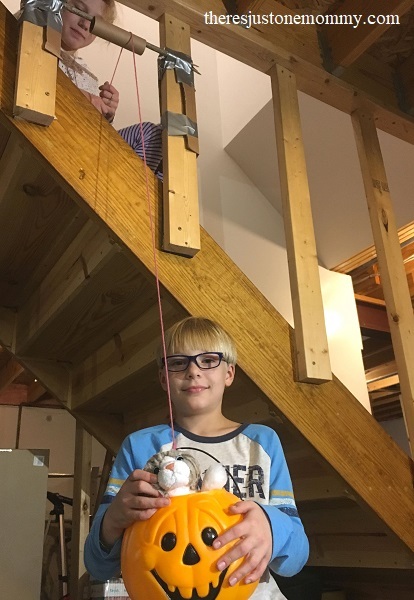 In this Halloween STEM activity your child will be making a basic pulley system. A basic pulley is made of a wheel on a fixed axle, usually with a groove to help guide the rope or cable. This simple machine is made with just a few items and can help make work easier. 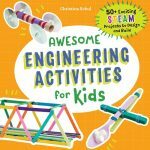 For older children you may want to provide the needed materials and let them experiment to figure out how to build the pulley on their own. 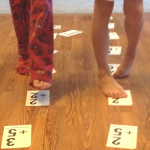 For younger children you may need to provide instruction. If you don’t have a wood dowel rod handy, you can easily substitute it with a nice-size stick. We were able to find one in our backyard that was 1/2 inch thick and long enough to be used between our stair rails. 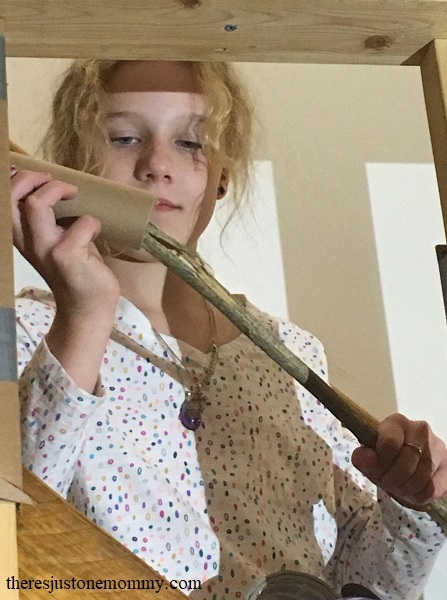 Slip the cardboard tube over your dowel rod or stick. The cardboard tube will act as the wheel of your pulley. 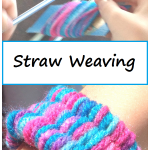 It will rotate around the stick (your axle) with less friction than just pulling the yarn over the stick on its own. Tie one end of your yarn to the handle of the pumpkin bucket. You will want to double knot it to be sure it stays secure. Thread the other end of the yarn over the cardboard tube. Your pumpkin pulley is ready to try out! Have your child fill the bucket with small toys or other items. Before trying the pulley system, ask your child to lift the bucket with one hand to see how easy it is to lift above their head. Then have them use the pulley to lift the bucket. Does it make the work easier? A pulley is a simple machine that can raise and lower things much easier and faster than we can with just our two hands. That’s because the pulley allows us to change the direction of the force we use when lifting an object. It’s easier to pull down on the yarn to lift the bucket up than it is to lift it straight up by hand. You can make a craft stick catapult to explore levers, another simple machine, with your kids. 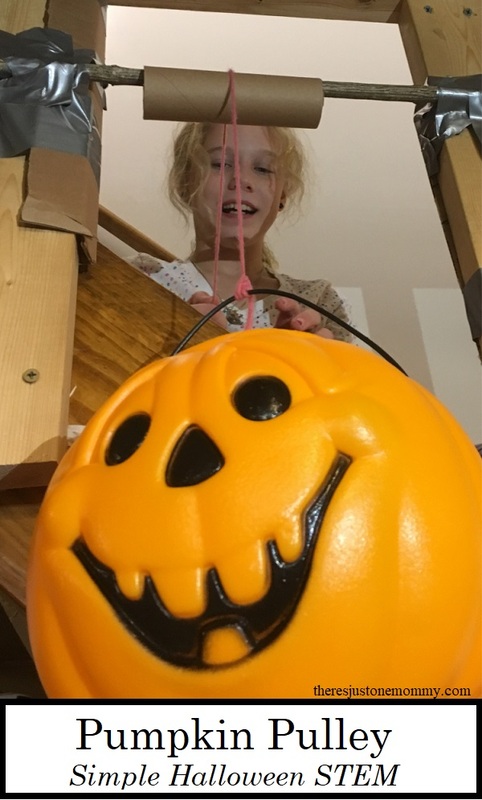 The kids have had lots of fun this week sending toys up and down in their pumpkin pulley. It has inspired hours of pretend play. 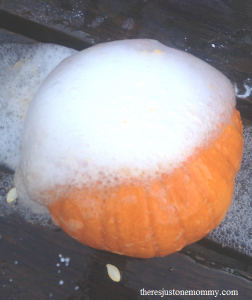 Grab a plastic pumpkin and gather your own kids for this fun Halloween STEM activity. What will they carry in their pumpkin pulley? 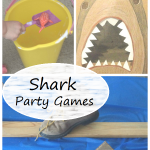 Get more fun kids activities like this delivered to your email by subscribing to our newsletter.